Last night, Frank, Peter and I had a quick dinner at the ever-reliable Yamato, then headed off to Melba Hall for a recital put on by Melba Recordings. It started with the Tin Alley String Quartet doing a very creditable performance of the Rosamunde Quartet. It reminded us all of how good it is to see a concert in a small hall where you can see and hear everything very clearly. After interval, Steve Davislim (tenor) and Anthony Romaniuk on piano did the song cycle, Die Winterreise. Same things applied: very nice to be close (fourth row) to such a splendid performance which the expansive Maria Vandamme of Melba is about to record. Gratuitous advice: turn down the melodrama by about three notches. But apart from that, it was really splendid. We were in the same row as Melba patron, Dame Elisabeth Murdoch, and Sir Gus Nossall. There were four distinguished men with beards in our row: Frank and I and Terry Lane and Barry Jones. Today had a quick lunch with Barry Dickins at the Children's Farm, then got another koala stamp at the renal clinic, then a Meanjin meeting. The Meanin review panel hasn't put in its report yet, so a lot is pending there. Meanwhile, the election rolls on. Tony Rabbit didn't have a good day in Health. And our local member, Lindsay Tanner, has scored badly again for another YouTube effort, this time on gay equality, where, in an unintentionally comic routine, he parades his gay credentials as having been a longtime fan of (wait for it) Elton John. Lindsay got a hard time from his schoolfellows for being a fan of a singer who was 'suspect' because he wore pink hotpants (I'm not making this up.) We're all glad that Lindsay understands gay oppression so well, but he actually fails to mention any measures to address it. Perhaps his wardrobe advisers should give him a few hints on policy. As Frank was working, P. and I did the shopping without him, but went to the Slow Food market at the Convent and, among other things, replenished his virgin olive oil and got bath milk, butter and duck for us. Tonight, I'll try to roast the duck with Cumberland sauce. We have to keep up with those Canberra duck-lovers somehow. After a quietly, crosswordy Sunday, we went to Frank's for a night of telly and his famous gourmet homemade pizzas. Two sorts: a conventional hot sausage variety, and a trendy rocket and smoked salmon one. Delicious. This week started quietly, then all hell breaks loose with the return of the Imparja manuscript, a visit from the B. Dickins, a renal clinic, a Meanjin meeting, a flying visit from Kirrilly, then the same from Jill W., then off to Sydney for the AIATSIS launch and visits to the kids and grandkids in Nowra and Croydon. Phew! But first, the duck! Wish me luck. This week was the last of the semester at Melbourne University, though I still have some marking to do but not much. On Wednesday night, P. and I had a quick but yummy Vietnamese meal in Victoria Street, then headed off to a 'grassroots' meeting in the Collingwood Town Hall where all our federal candidates were meant to be discussing transport policy. Unfortunately, we were treated to two varieties of socialists, the Dems and the Greens and the Liberal senate candidate, but no Lindsay Tanner. We were looking forward to asking him about our status as Green 'pickings' as he described us in his YouTube diatribe. There was no real explanation for his absence. One of the socialists said it showed his 'contempt for his constituents', and the other socialist predictably spoke the longest. Possibly his absence was explained by the presence of Krudd in Melbourne, or the fact that on the day, Krudd had announced a billion dollar road gift to Melbourne. If there was one unifying factor in the audience in the town hall, it was an anti-road stance (except for the Liberal candidate). Lindsay lost himself about 50 votes that night, I reckon. Perhaps he doesn't care. The rest of the week was spent marking assignments and planning a trip to Sydney for the AIATSIS launch next Friday and to see Kit and Nick and families. This week most of spare time was spent tidying up the Imparja manuscript, which has now gone back to the author for approval and final revisions. Meantime, the second last week of semester at Melbourne Uni. passed, with the students still reluctant to abandon being 'creative' and start doing the sums on their final assignments. I've received most of the second last assignments, and need to mark them before Wednesday (those I've received already). Latecomers will have to wait. Surprisingly, most of them seem to have picked the harder option, thinking it was easier. Meanjin had its launch on Thursday for what is probably Ian Britain's last 'themed' issue, on the law. High court judge, Susan Crennan, launched it with elegance and wit in the Executive Lounge above the Melbourne Uni. Bookshop (Professional) in the Gilbert building on Grattan Street. Ian made a graceful exit speech. Today, P. and I are off to Jeff's Shed for the Sustainability Show to investigate the possibilities of solar heating, as we need to replace the current heater. It is very confusing working out which state and federal subsidies apply to us and whether it is really worth it, as we don't use very much hot water really. However, we'll look at what's on display and maybe get a few quotes. Also happening today is the Great Debate between Krudd and The Rodent. We'll watch Kath and Kim. Even a repeat of an old episode will be better than a skirmish between gormless and wormless. According to Lindsay Tanner's internet diatribe against the Greens, we are only 'pickings' for the Greens anyway. So us 'pickings' can suit ourselves about what we watch. Meanwhile on the Leftwrites blog, two socialist factions have a brawl about support for the Greens. They seem to be arguing how many angels are on the head of a pin? Upriver from the pumping station at Yering Gorge. Midway is the outlet from the Maroondah acqueduct. Water is then pumped into Sugarloaf Dam, treated at the Winneke Treatment Plant, then sent off to the least posh parts of Melbourne. The posher parts get better water from the eastern Yarra storages. From the pumping station at Yering Gorge. Photo: P.
We got up early today to pick up Frank and Phoebe at 8am to head off to Pound Bend in Warrandyte for an all-day tour organised by the Yarra Riverkeepers Association, a group formed a few years ago to raise consciousness about issues to do with the Yarra, and monitor its state. The very friendly bus driver did a sterling job over sometimes difficult terrain as we visited a water purification plant in the Yering Gorge and looked at issues geological, of water quality in streams and the maintenance of parks. The whole business of storm water is now something we are likely to think about. 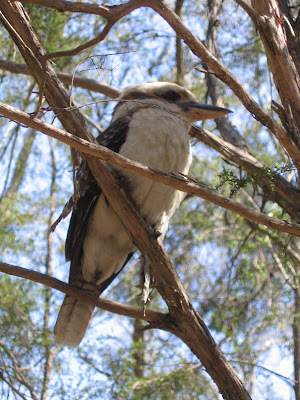 We stopped for lunch at the Jumping Creek Reserve: P. had made a great summer chicken which we had for lunch under the watchful eye of a kookaburra (see above). We finished where we had started at Pound Bend, and looked at the river tunnel diversion, and heard about the ranger's 18-year (!!) tenure in the State Park. The whole trip was impeccably organised, kept to time and the speakers along the way were concise and interesting. The Italian Girl in Algiers turned out to be very enjoyable. I like seeing opera at the Athenaeum Theatre anyway, because of the proximity of the performers. You can see and hear clearly and this time we had very good seats. Even if the singing is less than top rate, it works better in a closer acoustic. But most of the performances were good to excellent, and it was a jolly, if basic, production. Full marks to all. Lorraine came for lunch on Sunday to sample the computer to check out her options for getting one. Frank will demonstrate the laptop option (is there a song in that?) on Monday. P. made vitello tonnato and we had some of the cheeses and dips from the shopping on Saturday. The rest of the week was what has become the regular combination of Penguin research, Melbourne Uni. teaching and work on the Imparja manuscript. The only diversion was Frank coming for tea on Monday night before his trip to Newstead. We had the first recipe from the Cook's Book, a very simple but delicious steamed fish with ginger and spring onion. The next night we had an old stand-by, biftecks a la Lyonnaise or home-made hamburgers in plain English. After this week, there are only two weeks left of university teaching. I enjoy it, but it takes a big lump out of the week, going twice to Melbourne University. And I need to knock off the Imparja manuscript and get the research written up properly. We had a quiet Friday night dinner at Frank's with a very good bottle of merlot from our shipment from Buller's winery. We look forward to trying the durif, the shiraz and the whites. Frank had to work on Saturday, so P. and I took Phoebe off to Nicholson Street for a 'gourmet' shop to buy veal for vitello tonnato and steak for another try at French bifteks. While we were there we got some nice cheese from the Milawa cheese shop (some camembert, aged cheddar and mushroom pate) and some fish fillets from Canal's fish shop. It is a good place to go for good food, though a touch hard on the wallet. Then to Piedmonte's for the groceries and greeneries. Oh, and we couldn't resist a dozen Pacific oysters for lunch from Canal's. Then off to Books for Cooks to use my voucher from a grateful author, much appreciated. We got a new edition to replace our much thumbed and stained Margaret Fulton and a new book called The Cook's Book edited by Jill Norman, which contains lots of how-to-do-it tips as well as good recipes from a range of chefs from Europe, UK, NZ and here. Tonight, we're off to Rossini's Italian Girl in Algiers, at the Athenaeum, with Frank and Father. Frank came over for tea on Tuesday: just boring old roast pork followed by blueberry icecream, then on Wednesday morning Rochelle came round for lunch. She's been busy at the Newcastle 'This is not art' festival, which she was full of enthusiasm for. She's been rubbing shoulders with the young, experimental and radical which is always a refreshing, if sometimes frustrating, experience. This week I had a guest lecturer for the Melbourne Uni. class as my knowledge of indexing would fit on a postage stamp, though I've still had to attend. On Thursday, I popped over to Footiscray for a good chat with George P., who still hasn't been relocated to a new house/flat. Some kind of small-scale letter writing campaign might be called for shortly if something satisfactory is not found soon. The main problem is that there is a real shortage of public housing anyway, and almost no suitable 'halfway' accommodation which provides adequate support for independent living. Last night I went to Readings Bookshop for the launch of Coercive Reconciliation, a book produced by Arena on the NT intervention by the Howard government. It is an admirably quick response, since the intervention only started in June and the legislation was not passed until August. I've only just started it but it seems excellent so far. Of course, I shouldn't go anywhere near Readings because as well as that book, I also bought a novel and a CD! On Saturday, after normal shopping and lunch in Brunswick Street, P., Lorraine and I went to a talk at the Centre for Contemporary Photography by Helen Ennis. She is the author of the book which won the Premier's non-fiction award two years ago on Margaret Michaelis. She was talking about her exhibition: Reveries, photography and mortality. She is an excellent speaker and writer, as, though her thoughts are informed by modern theory, she avoids jargon and speaks very plainly. The talk, illustrated by some splendid (and confronting) photos, was absorbing. Of course, I bought the catalogue, though the exhibition doesn't come to the Mornington Gallery till next March. It was also our first visit to the new CCP in George St, Fitzroy, a building much improved on the old Johnston St premises. We all enjoyed a drink and antipasto afterwards at Cavellero in Smith Street, which was deserted because of the Grand Final. On Sunday, after the crossword, it was off to Genazzano where Ian Harrison held his 70th birthday party. Splendidly catered, it was a very enjoyable bash, with an incredible range of his friends from various bits of his life, who rarely get together. We chatted with some of them, most of whom I hadn't met before. Now it's back to the grind: with the whole of the large Imparja manuscript stretching before me.